Fashion Style: Mega wedding dress hint - beginning to bustle - eee! Mega wedding dress hint - beginning to bustle - eee! 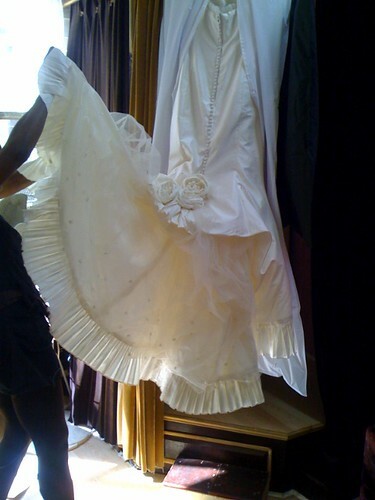 Mega wedding dress hint - beginning to bustle - eee!, originally uploaded by KT Flicker. This is the final wedding dress hint until the actual day, which is August 31. I am so happy about this dress, and so proud that Jenny and I did it, that most other wedding details are by the wayside. If we are having appetizer overload, or who the heck is setting up the wedding because the Father of the Bride has hired himself to do this job, or the fact that all men will be playnf 9 holes of golf the morning of the wedding due to "family tradition", therefore negating all manpower to set up the wedding. Yup. I have a wedding dress of raw silk and tulle, with two forms of fabric flowers and a pull string bustle. Now then. I still need to make this vale and Gerdy leash!